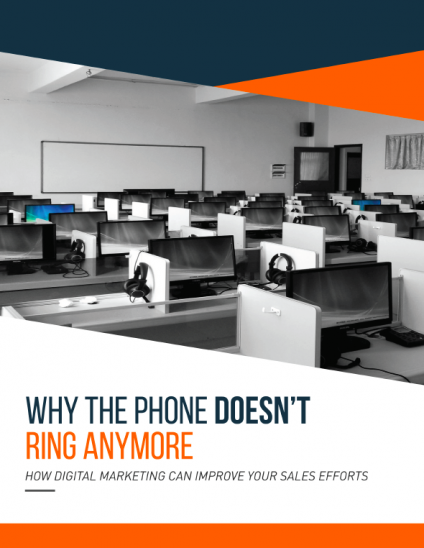 Your customers aren’t calling you anymore. Are you still waiting for the phone to ring? It’s frustrating to find yourself seeking better growth options when your company has been around for as long as it has. But the truth is it’s not your fault – it’s the internet’s. The last time you needed something you took a certain route to finding the necessary information to make a purchase decision. Are those same routes set up to allow your customers to find your company? Your customers may find it easier to Google the information they need instead of calling you. If your company isn’t positioned to help them in this new landscape you may be missing new sales opportunities. We’ve observed these changes for several years and have assembled an explanation that can help your company get a hold of the right activities to achieve your desired growth. Understand why people are changing the way they are making purchasing decisions in today's digital-first world. Better understand what are actual "vanity marketing metrics" and what meaningful metrics you should measure your activity by. Stay up to date with all of the new ideas that shape the world. Learn not only the best practices, but "next practices" as well. How to hold your team or next agency accountable for the strategy they put in place. WITH THIS WHITE PAPER TODAY.